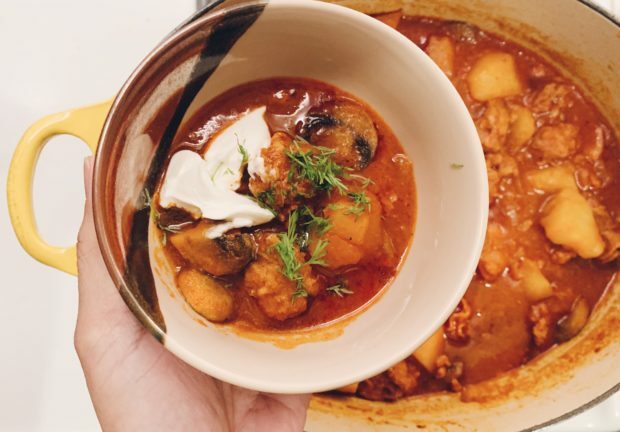 New York City temperature dropped to “feels like -15F” during the long weekend that I was forced to make this Spanish chorizo and potato stew before hibernating. Actually, “forced” is such a strong word; it was too easy to be forced to make it. It was a hearty meal that did not require much effort. 1. Render bacon fat by heating a large pot over medium heat. Add bacon and cook, stirring occasionally, until beginning to brown but crisp, about 7 minutes. Remove to a plate. 2. Add onions to the same pot with the bacon fat. Cook, stirring often, until softened, about 10 minutes. Add garlic, and cook, stirring, about 3 minutes. Stir in tomato paste and cook until slightly darkened in color. 3. Return bacon to pot, then add the chorizo until slightly browned. 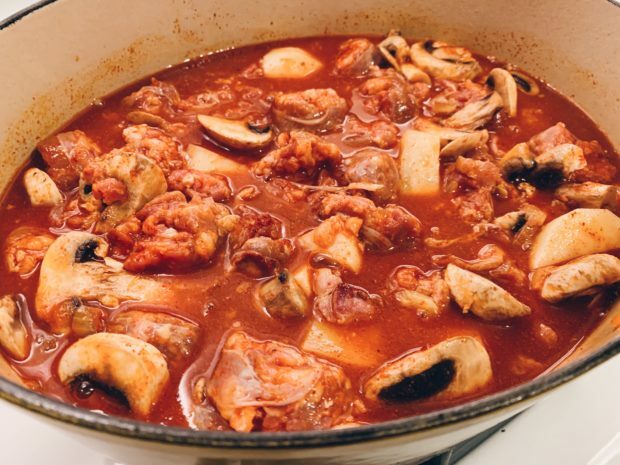 Add the potatoes, mushrooms, broth, paprika, and cayenne and bring to a boil. Reduce heat so liquid is at a bare simmer and cook, stirring occasionally, until potatoes are tender, about 30 minutes. Season with salt. 4. Remove from heat. Ladle into small bowls and top with a dollop or two of sour cream and torn dill. Where were these tubed tomato paste all my life?